Everyone wants to make a good first impression, businesses included, but less than 40% of content marketers are adept at actually ensuring their first impression is a) relevant to their brand, and b) a good first impression. Getting this first impression right is vital if you want readers to stick around. ​Just think about how much content is published every day (there are around two million blog posts put out there every day). In order to even get a look in with your audience, you need yours to stand out. ​That doesn’t mean garish colours and flashing lights. It means drawing readers in with something they want to read. But, more importantly than that, it has to be something they need to read in order for them to stick around. Them wanting to read something? Well, that’ll keep them interested while they scour the post. But them needing to read it? That’ll keep them on your site and clicking around. Let’s talk for a moment about the consumer buying process. Targeting consumers who are in the buying process is vital if you want to make sales. ​Because these are the people who are ready and willing to hit the buy button – they are actively looking to hand over their money. The recognition stage, where the consumer realises they need to buy something to solve a problem they have (whether it’s someone who needs to buy a tent because they’re going camping, or someone who’s looking for a time management tool to track their working hours). The information search stage, which is where the consumer starts looking into the different brands who offer the product they need. The evaluation of alternatives, where the consumer compares products by different brands to see which one will best fit their needs. ​For the purpose of this post, we’re going to focus on the recognition stage, because that’s the moment a consumer realises they need a problem solving. I want to talk for a moment about Dropbox. You know, that huge, multi-million-dollar company that literally blew up overnight? The issue they faced when they first released their product was that consumers didn’t know they needed Dropbox’s services. It’s easy if you sell tents, because consumers know they need a tent if they’re going camping. But something like an online documents folder? People need to be told they need that. Which is exactly what Dropbox did with an impressive explainer video. They laid out all the reasons why consumers needed their services. It was a great first impression. At that stage, not many people had heard of Dropbox, so when they went to their site or found them via other means, they needed to know immediately how Dropbox could help them solve a problem. It resulted in over 1 million users signing up in the first year and led to Dropbox being the absolute mega-company it is today. And all they did was attract consumers in the right way by showing them how they could solve a specific problem (even if the consumer didn’t know they had said problem). Remember, nine times out of ten your content is going to be the first point of contact consumers have with your brand, whether it’s a blog post they’ve clicked through to from social media, or a page on your site that they’ve been directed to via a Google search. Your content is your metaphorical sales person – you know, the kind that comes up to you in-store and asks what you’re looking for that day. So how can you use your content to, firstly, attract consumers and, secondly, get them to stick around? As humans, we gravitate to people who are similar to us, and this works for brands, too. We’re more likely to find ourselves checking out a brand that has the same values as us. Because we like to feel connected; we like to feel like we belong. It’s human nature. The best way you can tap into this is to speak to your ideal consumers in a way that they’re used to. That means if you want to attract fun-loving millenials, you don’t want to be using stuffy language peppered with difficult jargon. You instead want to speak conversationally in a way that those fun-loving millenials are used to being spoken to in and can relate to. The biggest mistake brands make is creating their content to fuel their needs. That means bigging up their product, highlighting the incredible history they’ve had, and discussing investors they’ve just got on board. Consumers don’t care about this stuff. They simply care about how you and your brand can solve a problem they have, and this is particularly important in the recognition stage of the consumer buying process. Because if the consumer doesn’t find what they’re looking for on your site (a.k.a. they don’t find a solution to their problem), they’re going to move onto the next site that can help them. Remember the next stage is the research stage, so they’re ready and willing to check out a number of brands until they find the right one. You can counteract the metaphorical “me, me, me” content that a lot of brands publish by specifically tapping into the benefits of your product or service and centring your content around what it can do for the consumer. They don’t care that you just received funding from X investor. They do care that this product will help them save two hours a day. First impressions are everything, but they’re worth nothing if you can’t keep your readers sticking around for long enough to buy. And, in the recognition stage of the buying process, these people are actively seeking a solution to a problem. Like I mentioned before, they’ll be shopping around for the best deal or the product that suits their needs the best. Which means they’re likely going to be reading a lot of content on similar topics. So how can you make sure you stand out in a sea of others? How can you rise head and shoulders above your competitors and other brands circulating in your industry? The answer is to make sure your content is better than theirs. Adding in research. People prefer to buy from influencers and brands with authority. Adding research and data to your content will position you as an expert and give your content a backbone. Adding in personal experiences. As humans, we like to make connections with other humans, so to make your content the best it can be, you want to be sharing personal stories to help people relate to you and your brand. Bring these three things together, and you’re going to find yourself consistently creating content that’s engaging but, most of all, that positions your brand as the solution to a problem the consumer is facing. When they move onto the next stage of the buying process – the information search stage – your product will be at the front of their mind. 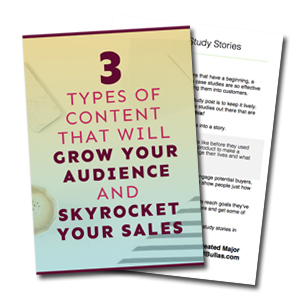 Are you ready to create content that really attracts consumers who are ready to buy? You know, the people who are raring to hit that buy button? Get in touch with me today to find out how I can help you.